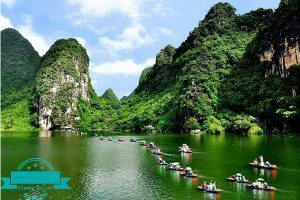 Vistors can travel to Ninh Binh province in every season of the year; however, the most ideal time is from January to March according to the lunar calendar. In spring, its weather is not too cold or too hot, so travellers can combine travelling , going on a pilgrimage, and going to the church to pray for luckiness and happiness. Apart from this, at the end of May and June is the occasion for ripe rice on the fields in Tam Coc. Besides, Trang An is a good place for travellers to take photographs as well. 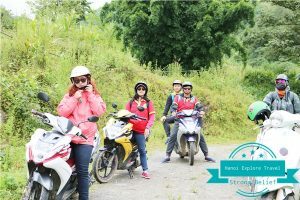 You can book a Ninh Binh Tour that includes transportation, you don’t need to worry about how to go anymore. Take a look at our Ninh Binh Tours to the most popular destinations in Ninh Binh. It takes 2.5 hours to get here and the train stops at the station at Ninh Binh City Center. 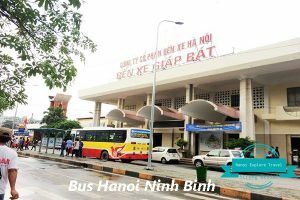 About $3.5 USD is you need to pay for a one-way ticket from Hanoi Train Station to Ninh Binh train station. It is not considered as a nature reserve, Van Long wetland is but also a place with attractive views and landscapes. It is called “bay without waves” because when you go on a boat on the lake, you can realize still water surface , which is the same as a giant mirror. As if Van long was a painting, it refected every angle of limestone moutains named Meo Cao, Mam Xoi, Hom Sach, Da Ban, Nghien, Mo Coi, Co Tien, etc..
Thung Nam Bird Garden belongs to Ninh Hai Commune, Hoa Lu District, one of tourist attraction representing culture, spirit, diverse ecology and stunning views. 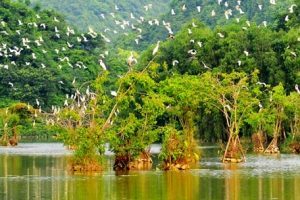 Besides being given the chance to admire the landscape of the wetland, tourists can explore wild lifestyle of nearly 40 different types of birds, around 50 thousand birds. Trang An is one of the most well-known tourist attractions in Ninh Binh at the present. The primitive, wild but wonderful views are recognized by UNESCO as the natural and cultural heritage of the world. Winding rivers along limestone moutain ranges create many natural and mysterious caves. Tam Coc, meaning “three caves” including Ca Cave, Hai Cave and Ba Cave, three of which are created by the Ngo Dong river running through the moutains. Tam Coc is the first boat route has been exploited in Tam Coc – Bich Dong tourism area. In the caves, the weather is very cool and there any many stalatites with different shapes. Bai Dinh Complex is the largest pagoda complex in Southeast Asia which covers 530 hectares of land. The whole complex consists of the original old temple for Buddhist privileges and a newly created larger temple for tourists visiting. As a spiritual complex, Bai Dinh Pagoda offers pleasant sights and gives off a peaceful feeling. Temples, shrines and pagodas are spread out over the hillside with fantastic views over the surrounding countryside. Bich Dong Pagoda ,which is 2 kilometers from Tam Coc depot, means “ the emerald cave”. It is named in 1773 by chancellor Nguyen Nghiem. In front of the cave is a branch of the Ngo Dong river winding around the moutain slope. There is a field opposite the cave. Non Nuoc Moutain is also called Duc Thuy Mountain, located in Northern West of Ninh Binh province, which is 70 meters in height and has a relatively flat top. Because of the location right between the confluence of the Day river and Van Sang river, the moutain gives extremely charming moutain – river beauty for Ninh Binh. On the cliffs of the moutain, over 40 poems were carved by historical, well-known man. Hoa Lu ancient capital is a national heritage complex of great importance and also is one of 4 noticeable, important places of Trang An international heritage complex. It has total area of 13.87 square kilometers and has existed for over 1000 years ; it is also a place storing historial monuments for many years. Thai Vi Temple is located in Van Lam Hamlet, Ninh Hai Commune, Hoa Lu District. 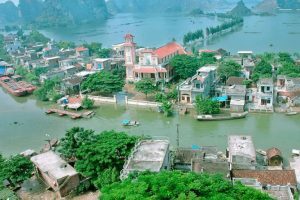 It is on the right of the Ngo Giang river and on the left of Coi Linh mountain, which brings the perfect harmony for thousands of years and creates Tam Coc as today, which is also known as “ shallow Ha Long Bay”. Visiting here, we not only can feel poetic beauty of moutains and rivers, but also admire the fine architectural works which are typical of attractive ,original identity and made by ancient people. 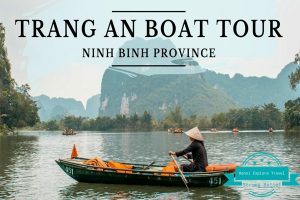 There are not many set ‘sights’ in the town on Ninh Binh itself, but this is a great place to visit if you want to get out and about and spend time in some of the Best Things To Do in Ninh Binh Vietnam. Includes all the major sights and activities in and around Ninh Binh. This is one of the most popular options for busy travelers. Join in 1 day in Cuc Phuong National Park with us to visit Endangered Primate Rescue Centre, visit Turtle Conservation program and botanical garden, mountainous trekking or trekking over flat paths. With more than 3 hours. You get on a rowing boat from the pier then going through Hang Dia Linh, Hang Toi, Hang Sang, Hang Nau Ruou. You will be dropped off near Tran temple to climb nearly 500 stone steps to Tran Temple. After that you continue being on your boat through Hang Sinh, Hang Si, Ba Giot, Hang seo, Hang Son Duong and then visit PhuKhong, Bao Hieu temple. Next, going through Hang Khong, Hang tran, Hang Quy Hau by rowing boat then return and the trip ends. 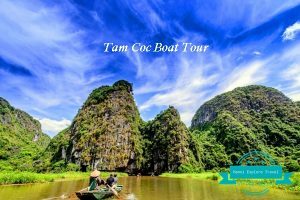 Starting your day by exploring limestone caves during a boat tour on Tam Coc river is one of the most unforgettable experiences for you. In Tam Coc people arrange and manage all boats very well. There are about 1500 boats lying on the Ngo river at Tam Coc wharf. The boats belong to about 1500 households with different numbers. Therefore each month each house hold just takes at least 1 tour or 2 tours. Ninh Binh is not only famous for its beautiful with many tourist attractions. If you have chances to visit Ninh Binh, And don’t know What to eat in Ninh Binh? Let’s note down those below dishes special and delicious food. The famous food here smell and taste with the flavor of limestone mountains where locals feed animals. 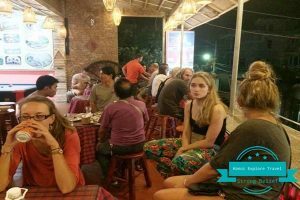 Don’t miss to try special foods which are cooked by locals with well cooking skills. We would like to introduce for you 6 best traditional dishes in Ninh Binh. It is one of the most well-known specialities of Ninh Binh , which is significantly different from the one from other regions, particularly in the sauce. The scorched rice has light yellow, even rice seed, crispy, greasy, but tastes very yummy. In Ninh Binh, there are many good types of food; however, Pisodonophis boro spring roll in Kim Son is the best. It has very savory and tasty flavour of roasted sticky rice, sourness of vinegar together with spiciness of ginger, garlic, chilly, peper and citronella. Its tast is very typical and once you have it, you will remember it forever. Ricefield crabs are roasted with wild betal leaves, a popular and countryside type of food in Ninh Binh and also characteristic of villages in Vietnam, also, this food is also recommended for tourists when they visit the ancient capital. It is because the food is not made from raised crabs that makes this speciality special and distinctive, which is crisp flavour of ricefield crabs mixed with the typical one of wild betal leaves. The good tastes the best when it is eaten with hot rice. Boiled mountain snails are extrememly well-known in Ninh Binh and it has natural-sweet taste because snails here eat grass, herbs and some other previous medicine plants. Therefore, mountain snails are cooked into differnt ranges of foods including snails fried with tamarind, garlic or simply just roasted mountain snails, etc..; however, the most popular and prefferable of which is still boiled moutain snails. In fact, guests can have it with lemon – chilly sauce or have it only to feel its natural – sweet taste. Residents in Hoa Lu processes goat meat into different foods consisting of: half-done goat meat, goat – spring roll, toasted goat meat, goat blood pudding, steamed goat meat,etc…; however, half-done goat meat is still the most delicious one. Its yummy taste lies on the secret to proceed goat meat very carefully and cleverly and on special spices which are types of leaves, fruits had together with half-done goat meat and especially ginger soy sauce. Tourists can try very distinctive taste of Yen Mac Fermented Port Roll in Ninh Binh; it is made from lean meat without fat, boilded rind, and some other spices like monosodium glutamate, salt, etc…after that it is wrapped by guava leaves to bring typical fragrant taste and banana leaves to create attractive rind. This food is usually had with lemon – garlic sauce.